Webasto has concentrated on practicality in designing its Webasto Pure charging station. And yet it is attractive in design and easy as child’s play to use. With the Webasto Pure charging station, you can charge up to 10 times as quickly as at a standard domestic socket. Take a look at our charging time summary to see how quickly the battery in your electric car will be fully charged so that you can get on the road. You can install the Webasto Pure easily and without complications or complex configurations. Once it has been mounted, all you need to do is use the handle to charge your electric car. The colour LEDs display the charging status at all times. Simplicity is key in the Webasto design: the charging station acts as its own cable holder. The charging cable is simply wrapped twice around the charging station to tidy it away. You can use a key to simply lock up your Webasto Pure charging station. This allows you to determine who is charging at your charging station. Despite its low price, safety is the top priority at Webasto. That is why the Webasto Pure comes with an integrated DC fault current sensor. This means that all you need is an inexpensive type A RCD in the upstream fuse box. The charging power of the charging station must be adjusted to the upstream installation and fuse to prevent system overload and tripped fuses. The charging power of Webasto stations can be configured between 3.7 and 22 kW with ease using DIP switches. The Webasto Pure charging station with cable is able to charge all electric cars with type 2 plugs. It is no longer just European electric car manufacturers that install type 2 plugs; Nissan are now including them on their new models in Europe. The charging cable is already integrated into the charging station. Simply plug in and start charging. Webasto is one of the world’s most successful suppliers of the automotive industry. With its charging solutions, it is now directing its attention to the end customer segment of the market. Its charging stations were developed with a focus on providing value for money. That is why it is now able to offer a top-quality charging station, with all its smart details, at an affordable price. The Webasto Pure Home is a home charging station and therefore conforms to protection classes IK07 and IP54. These notes represent a deviation from the operation and installation manual (Page 18). 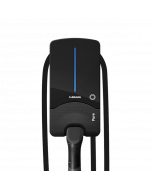 The Webasto Pure Home charging station may only be installed on private property. That means access to the property should be restricted. A mandatory requirement for installing the charging station is that it be mounted on a wall at a minimum height of 90 cm (as measured from the floor to the bottom edge of the device housing).